An annual tradition for many Adirondack backcountry skiers. 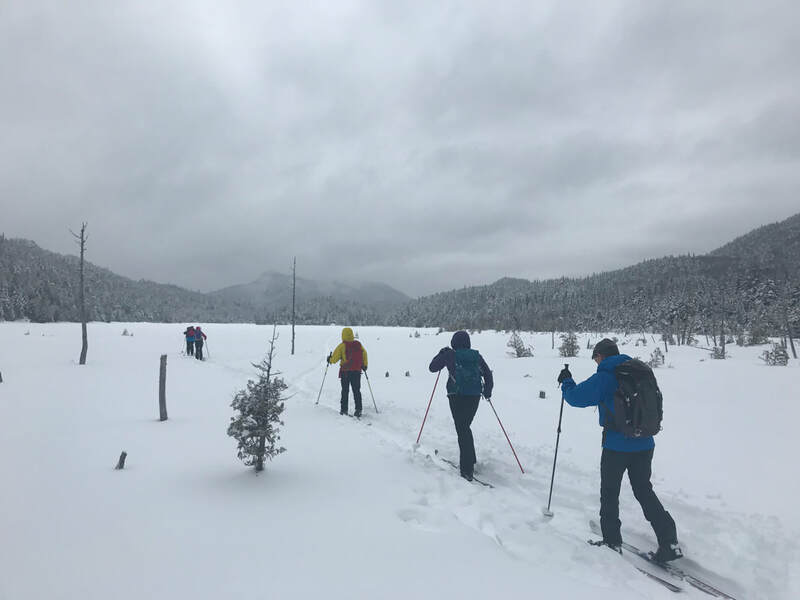 This classic traverse of the High Peaks Wilderness Area from north to south (or vice versa) rewards skiers with beautiful alpine scenery and some of the best backcountry trail skiing in the Adirondack Park. Meet at the Cascade XC Center parking lot. Final group composition will be determined in the morning. Two groups will start skiing at Adirondack Loj and Tahawus, respectively. Groups will swap car keys when they cross paths (usually somewhere on the Flowed Lands or Lake Colden). Total one-way distance is approximately 11 miles. Ski outing is FREE...But skiers must be current BETA members to participate (per our insurance policy). This is an advanced backcountry ski tour. Skis w/ metal edges are recommended but not required (skins are not required but some skiers may want them for climbing). Participants should be physically capable of skiing 10-12 miles in variable snow conditions and on sometimes steep, narrow trails). Participants should be prepared to spend 6-8 hours outdoors in cold temperatures and possibly inclement weather. Dress in layers, bring extra clothing, gloves and hats. Bring plenty of water and food. Sunglasses or goggles recommended for crossing the ice on Lake Colden and Avalanche Lake. Not recommended for children under the age of 12 (parents please use your best judgement).